I often make couscous salad for lunch. Well to be exact I make it the night before and pop it in the fridge. I love that I don't have to use any pots. I just pour my couscous into a measuring jug and cover it with boiling water, then let it do it's think while I finely chop some carrot, cucumber and cherry tomatoes. Then I fluff the rice up with a fork and mix it with the chopped salad. For extra flavour I crumble half a vegetable stock cube into the measuring jug with the couscous before adding the boiling water, then I give it all a good stir. Do you flavour your couscous or leave it plain? This time I was making a couscous salad for dinner so I wanted to make a bit more effort. I still added the stock cube, but this time I decided grilled vegetables would be more satisfying than finely chopped salad. To get that smoky flavour into vegetables Id usually roast it with a little oil, but as I'm watching my weight at the moment I decided to use my new TEFAL OptiGrill which was much quicker and I didn't have to use any oil which is a big plus when you are counting calories. You will notice there is a coloured disc on the handle. It's actually an automatic sensor. At the start of cooking the indicator light is blue, then it moves to green, then yellow when food it lightly cooked, orange when it is grilled to a medium level and re when it is well done. It also has a thickness detecting sensor which regulates the grilling temperature according to the size of the food you are cooking so food should be perfectly cooked each time. I've been using it for grilling vegetables without oil and I also made smooshed new potatoes. I boiled new potatoes them pressed the grill down on them and left them to crisp up, like little smooshed roast potatoes. I'll also be putting it through it's paces grilling tofu and homemade veggie burgers as well as toasties and paninis. I got a cheap small grill when my last grill died and it had no weight to it, so I had to make toasties with a tin of tomatoes on top to give it some weight. Having this new grill is a joy! And it the plates go in the dishwasher HOORAY!!! So what did I grill? For my salad I grilled sliced carrot, aubergine and courgette, then I topped my salad with sun-dried baby plum tomatoes and a generous dollop of pesto to mix through the salad. It was super tasty and I'm pleased to say super quick. 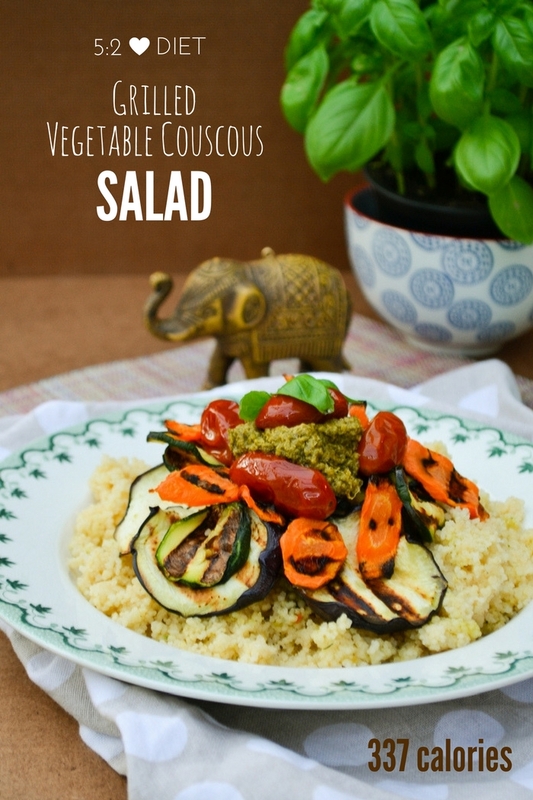 A satisfying warm couscous salad that's perfect for a light dinner. 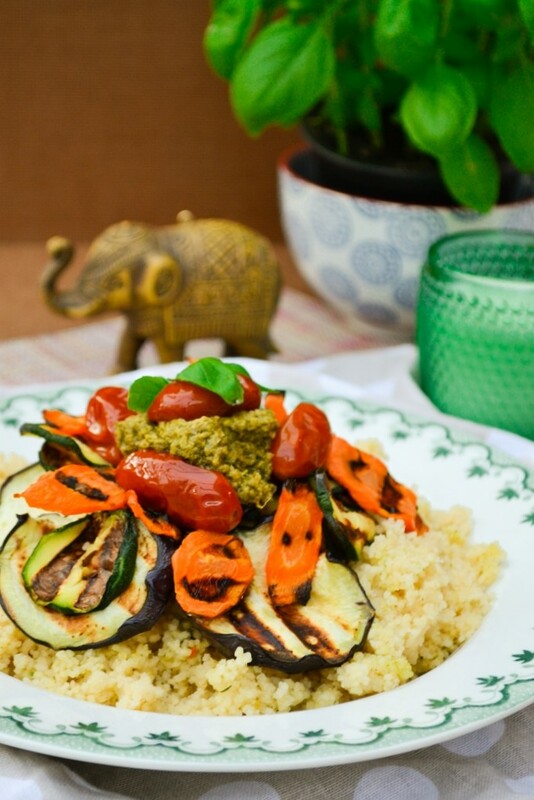 The flavoured couscous is topped with grilled vegetables, sun-dried tomatoes and pesto. 1.Slice your vegetables and heat your grill. 2. Pour the couscous into a measuring jug and crumble the vegetable stock cube over it, then top with boiling water. Stir well with a fork, then set it aside and leave it for 10 minutes. After 10 minutes you can fluff it up.3. Grill the vegetables, until they have pleasing charred lines on them. You may need to do this in two batches. 4. Pile the couscous on to plates and top with the vegetables, sun-dried tomatoes, fresh herbs if you are using them and a generous dollop of pesto.5. Enjoy! You may have seen from my post The New 5:2 Diet Explained that I 'm back on the 5:2 Diet and watching my calories. This grill is perfect for that as you can grill without oil. This salad has 337 calories for 3 servings and 503 calories for a rather big serving for 2. It's high in Vitamin A and a good source of Vitamin C. There's also some calcium and iron in there. If you are interested in trying the 5:2 Diet, you can follow my new Facebook Page 5:2 Diet for Vegetarians or my new 5:2 Diet for Vegetarians Facebook Community Group. So far I've lost 5 lbs and I'm feeling really positive about it. Disclosure: I developed this recipe for Tefal to promote their Optigrill. I was not expected to write a positive review and any opinions expressed are my own. 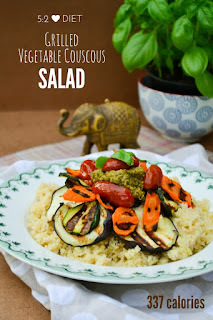 Grilled vegetables are one of my favourite summer treats and I love that you paired them with something light like couscous. Yes they have so much flavour. I usually roast them but this way is quicker and no fat. It's great with couscous. Love the veggie stock tip for the couscous! Such a colorful and vibrant recipe! Yes, I always do that, it adds so much flavour. grilled vegetables are my fave - I am loving this whole dish, and that grill looks fab! It makes such a difference flavouring the couscous doesn't it? And yes the grill is fab, it has a really good weight to it. I always wanted to make couscous at home but keep postponing as couldn't find the right recipe for me. I'll look no further. 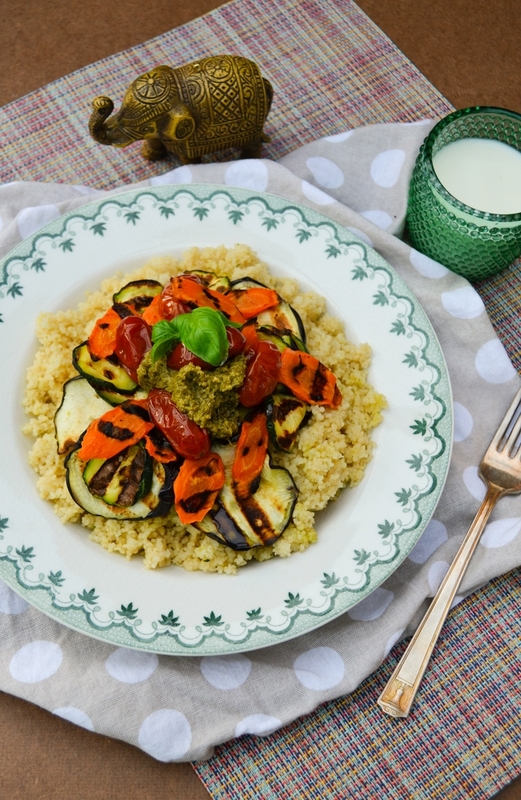 This looks as the perfect couscous recipe! It's so easy, just pour some in a jug with boiling water and walk away, then fluff up 10 minutes later done. I love grilled vegetables, such a flavourful and healthy dish. OMG, I don't believe it! Last night we had roasted vegetables on couscous, I added half a jar of red pesto to the hot water for the couscous to add flavour. I roasted my veggies in the oven but the Tefal Optigrill looks ideal for the job. Haha, great minds and all that and yes the Optigrill is rather fab. Well done on losing 5lbs Jac that's fantastic! This sounds like the perfect tasty lunch - I'm definitely going to be giving it a try. Thanks Ren and yes it's perfect for lunch. This looks mouth watering! It would work well on Weight Watchers too (vegetables have no points so you can have as many as you like) so I'll definitely be trying it. The OptiGrill sounds like a great kitchen gadget to add to my wish list. Well it sounds like the perfect dish if you are following the diet. Yes the Optigrill is fab. It really perks up the flavour and works well. I made a couscous salad last week and used 2/3 apple juice to 1/3 water - I also added some currents, raisins and dried cranberries to the salad - it was delicious. That's a really good idea, it must be fruitily delicious! Haha, well that is the mark of a good gadget when you don't have space. Wouldn't that just make for a wonderful summer meal! Oh yes, it definitely does. Fab news about the weightloss - I have no idea how much I'm down, since my scales are back in Slovenia. Hoping there'll be a nice surprise waiting for me when I get back in December! LOL! I bet it was even better in Morocco. I didn't know they steamed the couscous. Thanks re the weight loss although I've probably put it back on during my week away. We do the same as you, we'll cook the cous cous in a stock rather than plain water. That or I toss through a dressing once it's cooked and drained. So yum! It really does make a difference to the flavour and yes dressing can be good too.